Right-back Hector Bellerin has started every game so far in the new Unai Emery era. Against reigning champions Manchester City, Chelsea and West Ham United, the Spanish full-back has played every minute for the Gunners thus far. His performances have also attracted plenty of scrutiny. The 23-year-old’s current form has been subject to some praise, but he has also been singled out for criticism. The reason for this is that, in an attacking sense, Bellerin has been excellent for the North London club. Defensively, however, he has been short of the standard required. The key to getting the best out of Bellerin is balance. In practice though, that is much easier said than done, especially when Arsenal are already currently undergoing seismic changes in many other areas on and off the pitch – the unavoidable consequence of a first managerial change in over two decades. It would be unfair to consider Bellerin the sole problem with Arsenal’s defence, as the Gunners’ back line is not yet functioning effectively as a whole and each member of it must improve. A variety of changes must be implemented if Emery’s side are to tighten up at the back. Arsenal are naturally an attacking side who like to have the ball and get forward. Emery will want to maintain that offensive mentality, but temper it with greater defensive diligence than has been evident in recent seasons. To do so, he must engineer cohesion between all of his players to ensure that they know exactly where to be on the pitch in any given scenario. Like with most top teams, Arsenal’s full-backs are far more than just defenders. The modern full-back must be effective in the final third, and in that sense Bellerin is excellent. Against West Ham last time out, his marauding runs, frightening pace and accurate deliveries into the box caused the Hammers all manner of trouble. It is no fluke that Bellerin was able to set up the Arsenal left-back, Nacho Monreal, for the goal that levelled the game. Both of the Gunners’ full-backs combined in the opposition penalty area to goal-scoring effect. However, this positive aspect of the team’s tactic has its down side. Having both Bellerin and Monreal pushed so high up the pitch leaves Emery’s side extremely exposed should they lose possession and suddenly find themselves facing a quick counter-attack – as has already happened numerous times this season. The fault for this does not wholly rest with the Spanish full-back pair though. Arsenal are not the only side who allow both of their full-backs to attack simultaneously. Both Pep Guardiola’s Manchester City and Jurgen Klopp’s Liverpool do the same, yet they have systems firmly in place to prevent themselves becoming the victim of counter-attacks. Emery must implement these systems at the Emirates Stadium quickly. It begins with the midfield. In either a two or three-man midfield set up, one man must play the anchor role. Meaning that when either one or both of the full-backs bomb forward, this midfielder sits deep to cover the vacated space. Granit Xhaka is currently tasked with this duty for Arsenal, but the Swiss international lacks the mobility and defensive awareness required to pull it off. 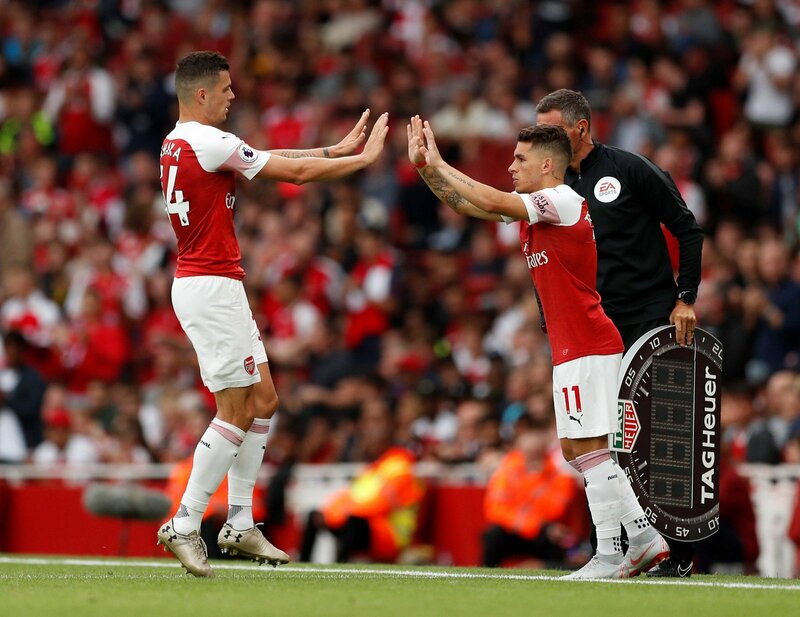 New arrival Lucas Torreira has the attributes to fulfil this role, and as soon as he is ready to become a regular part of Arsenal’s starting XI the more secure they will become. The wide forwards – be it Mesut Ozil, Alex Iwobi, Henrikh Mkhitaryan or Danny Welbeck – must also be prepared to do their defensive dues. When the full-back overlaps on these players, they must automatically be alert to the danger of opposition players getting set to infiltrate the space should there be a turnover in possession. Again, the likes of Ozil and Mkhitaryan have so far shown a lack of suitability for this role. In light of this, Emery should consider tweaking the way that Bellerin and Monreal attack in the final third. A hangover of the Arsene Wenger era is damaging the Gunners here. When the French manager arrived in North London, he was one of the key instigators of the change in how full-backs operated. Ashley Cole, Lauren, Lee Dixon and Nigel Winterburn all flourished under Wenger’s progressive instructions. A key aspect of Wenger’s tactic was encouraging his full-backs to get to the by-line. From there, they could fire crosses and cut backs into the opposition box from behind their defensive line. Thierry Henry, Ian Wright, Dennis Bergkamp, and many others, were all grateful beneficiaries of this kind of service. At that time – the late 90s to the mid-2000s – Wenger’s full-backs largely got away with their overtly aggressive attacks as most opposition sides didn’t contain the kind of full-backs capable of punishing them. Whilst, in Gilberto Silva, the Gunners had a holding midfielder who provided excellent cover for the advanced defenders. That is no longer the case. Aaron Wan-Bissaka, Arthur Masuaku and Ryan Bertrand are all examples of very attacking full-backs who play outside of top-six sides. Full-backs capable of springing rapid and effective counter-attacks are now commonplace throughout the league. Systematically, Arsenal have failed to adjust to this change, and are now getting consistently caught out in a manner they didn’t used to. One way they can change their approach in order to catch up with this transition in styles is to temper their desire to reach the by-line – or at least reconsider how they get there. Manchester City’s and Liverpool’s full-backs often only travel as far as the edge of the opposition’s 18-yard box, at which point, if an approach to the by-line is made at all, it is often done by the forward rather than the defender. This is done so that if possession is lost, the defender is that 20-yards or so less advanced and therefore better able to recover his position. These teams don’t lose attacking impetus due to this because their full-backs are exceptionally good at delivering the ball into the box from slightly deeper positions – City’s Benjamin Mendy and Liverpool’s Trent Alexander-Arnold are particularly fine examples of this. That isn’t to say that Klopp’s and Guardiola’s left and right-backs never go to the by-line (Kyle Walker, with his blistering pace, often does), they just do so more selectively and they have a midfield behind them better organised to compensate for this. 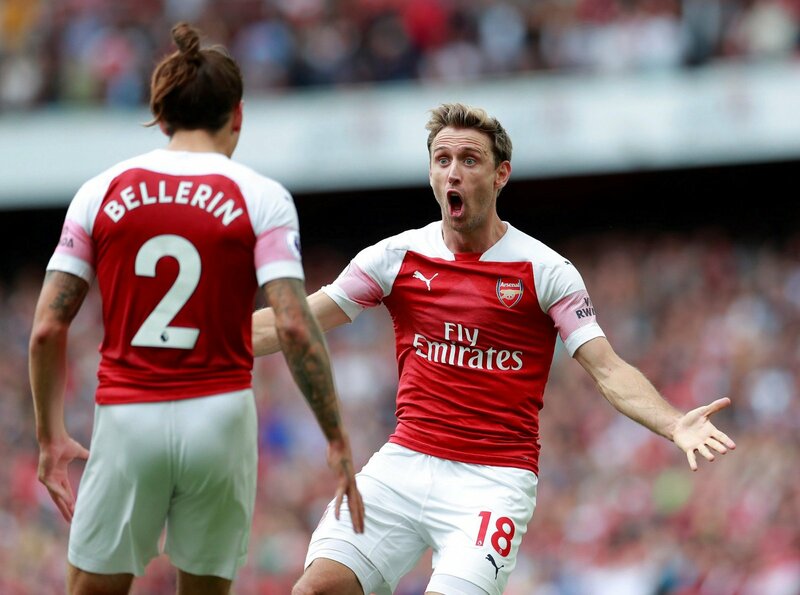 If Emery is to get the best out of Bellerin – and indeed Monreal – he must set up his side so as to protect them when they attack. That isn’t to say Bellerin doesn’t need to improve defensively himself. His marking and reading of the game could do with work, but getting the best out of the individual requires first setting the team up right. If Emery can see that done quickly, then Bellerin could prove a star for Arsenal this season.